Angelo John Gage, chairman of the white nationalist National Youth Front, steps down as the group faces fundraising issues and a name change after a threatened lawsuit. Citing the need to focus on the forthcoming birth of his first child, Gage has passed the reins at NYF to the organization’s longtime vice-chairman, Nathan Damigo. NYF, which is the official youth wing of the white nationalist political party, American Freedom Party (AFP), is focused on recruiting young adults, 18-35, into white nationalism. Membership is reciprocal with AFP. NYF members are automatically registered with the group once they’re older than 35. Gage was once a congressional candidate with AFP. Though NYF garnered a lot of press for aggressively targeting college professors at Arizona State University and Boston University who taught courses that the organization deemed “anti-white,” it has since fallen largely quiet. 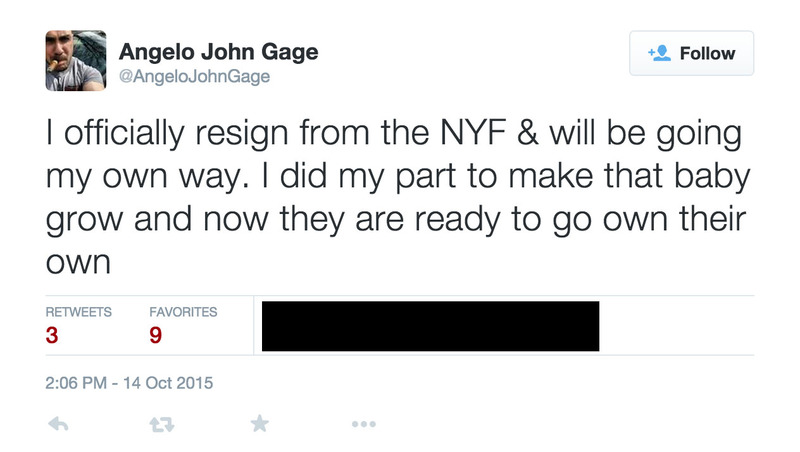 Even with pleas from Gage in his farewell video to not lose faith in him or the organization, its future seems to be in doubt. Its typical boisterous claims that “Nothing will stop us” have never seemed so hollow.